Avalon is Santa Catalina Island's only incorporated city and is the southernmost city incorporated into Los Angeles County. Avalon is a major tourist destination for visitors looking to experience the island's rich history and natural wonders, famed for its glass-bottom boat marine wildlife tours. Catalina Island Museum was the vision of Philip K. Wrigley, the son of island community founder William Wrigley, who strived to preserve the island's heritage and culture through a public space for museum exhibits. 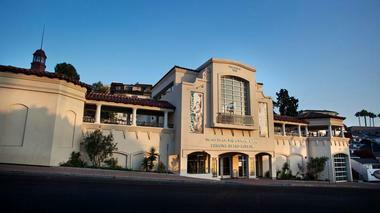 The museum was originally opened to the public within the historic Catalina Island Casino facility in 1953 and was housed within the casino until 2016, when it moved to its new permanent facility at the Ada Blanche Wrigley Schreiner Building. Today, the museum strives to preserve the region's social and cultural history through permanent and temporary rotating exhibits. More than 10,000 historic photographs are showcased within the museum's collections, along with extensive collections of pottery, tile work, sport fishing artifacts, and artifacts related to the region's indigenous Tongva people. Exhibits focus on the area's social history, with many examining the area's connection to Hollywood filmmaking. 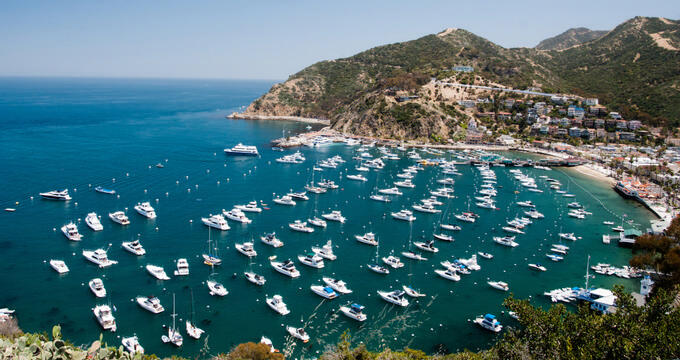 Catalina Island Company is Santa Catalina Island's premiere tourism company, overseeing more than 20 historic buildings, resorts, and tour and excursion companies operating out of the island. The company was established in 1894 by Hancock, Joseph, and William Banning and was acquired by William Wrigley Jr. in 1919, which led to the island's modern-day tourist development and protection as a natural oasis. Today, the company has been an island staple for more than a century, overseeing top visitor attractions such as the Catalina Island Casino's historic grand ballroom, the luxury resorts Hotel Atwater and the Pavilion Hotel, and the Catalina Island Golf Course, the nation's oldest-operating golf course west of the Rocky Mountains. A wide variety of tours and excursion experiences are also available, including zipline eco tours, aerial adventures, harbor lights tours, and treks along the Avalon Canyon Trail. 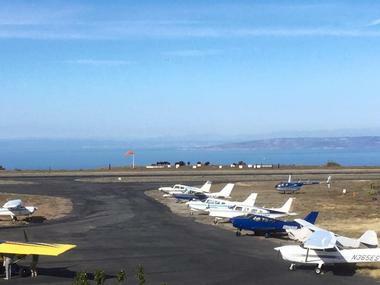 Airport in the Sky, also known officially as Catalina Airport, is a private airport that is located atop Catalina Island's highest elevation point at 1,602 feet. The airport is open to the public daily for the landing of general commuter and tourist aircraft, with limited supply airfreight operations also maintained on a regular basis. It was originally opened to the public in 1941 as the Buffalo Springs Airport, constructed by island developer William Wrigley Jr. During World War II, the airport was used as a training facility, and during the mid-20th century, the airport accepted commercial passenger flights, gaining public notoriety for its inclusion in the feature film The In-Laws. Today, it is primarily utilized by private pilots and is accessible to visitors through Wildlands Express tours, which operate daily. In addition to the airport's spectacular mountain views, its DC-3 Grill is a top island attraction, serving a variety of beef, bison, chicken, and vegetarian burger and sandwich options. Journey Catalina is a family-owned tourism company offering a variety of eco-friendly island tour options for Santa Catalina Island visitors. The company has been in business for more than two decades, offering Jeep eco tours of the island in six-passenger open-air vehicles. All tours explore top tourist sites on the island, including the town of Two Harbors, the Airport in the Sky, and Rancho Escondido and the Rusack Vineyard. Tours may be customized to meet participants' travel needs and may be scheduled to depart as early as 8:00am. Demand-response island taxi service is also available through the company, including delivery service, along with auto repair service for vehicles and golf carts. Wrigley Memorial and Botanic Garden is located approximately half an hour on foot from the city center of Avalon, spanning more than 38 acres along majestic Avalon Canyon. The garden is located at the final resting site of island community leader William Wrigley Jr., with a 130-foot monument tower commemorating the site of his former interment. Following his death, the land around the memorial was cultivated into a botanical garden facility by Wrigley's widow, Ada. Today, the monument and gardens are overseen by the Catalina Island Conservancy, spanning more than 38 acres and showcasing endemic California island plants. The gardens also serve as a trailhead for popular island trail Garden to Sky Trail. Golf Gardens Miniature Golf is one of Catalina Island's top family fun centers, offering a year-round 18-hole golf course that is acclaimed as one of the world's most scenic and challenging miniature golf courses. The par-51 course has been in operation for more than 40 years on the island, located less than one block from Avalon's beautiful beachfront. It is open daily year-round, weather-permitting, with ticket prices available for adults, children, and seniors. All guests should allow approximately one hour for course play, with final tee times offered one hour prior to closing. Tickets may be purchased at the gate or in advance at any Discovery Tours location on the island. Hermit Gulch Trail Loop is an 11.75-mile hike that is accessible from the Hermit Gulch Campground in Avalon. The trail is accessible to visitors with permits from the Catalina Island Conservancy, offering unparalleled views of Catalina Island's southern tip. It begins with a 1.7-mile moderately-difficult uphill hike on the Hermit Gulch Trail, which offers expansive ocean views at its 1,200-foot peak. It then continues along the Trans-Catalina Trail Loop, which reaches a peak elevation of 1,600 feet and offers stunning views of both of the island's coastlines. At the end of the hike, the trail takes visitors back into downtown Avalon via Renton Mine, Wrigley, and Pebbly Beach Roads. A shorter trail route allows visitors to descend to the city's botanical gardens at the 6.25-mile marker. The Nature Center at Avalon Canyon is located on the site of Avalon's first public interpretive center, which was originally constructed by the Los Angeles County Parks and Recreation Department to preserve the natural and social history of the island. 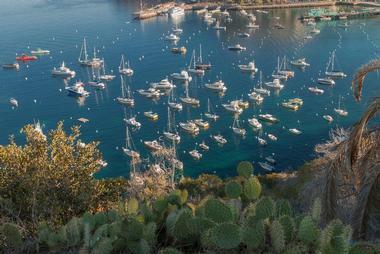 Today, it is operated by the Catalina Island Conservancy and is located near the city's botanical gardens, approximately a 20-minute walk from Avalon's town center. Self-guided visitor exhibits detail the natural history of the island, with a focus on conservation initiatives in the 20th and 21st centuries. Children's exhibits are also featured, along with a video library and a public resource center. The Green Pleasure Pier is the center of Avalon's tourism industry, serving as the loading and unloading point for pleasure cruises and ferries docking on the island. The pier is located along Crescent Beach and is visible throughout the city of Avalon, serving as one of its top tourist attractions and offering spectacular 180-degree views of the city's harbor and the nearby Pacific Ocean. It is home to a number of shopping and dining destinations, including casual quick-service hamburger joints and upscale fine dining seafood restaurants. Visitors can also embark on a variety of guided land and sea tours from the pier, including the city's famous glass-bottom boat rides, which offer a close-up look at underwater marine life in the region's surrounding waters. Catalina Island Casino is a public event complex that takes its name from the Italian word for "gathering place," not to be mistaken with American casinos that are centered on gambling. The complex was originally commissioned for constructed in 1929 by William Wrigley Jr., the founder of Santa Catalina Island's modern community. Throughout much of the 20th century, it served as the center of Avalon's social life, offering dining, dancing, and movie-watching opportunities for patrons arriving by boat. Today, the complex still offers first-run films at the historic Avalon Theatre, with public and private special events hosted at its historic grand ballroom, including a New Year's Eve celebration and the Catalina Island JazzTrax Festival. Walking tours of the casino are offered periodically, including a behind-the-scenes tour and a twilight tour. The Avalon Theatre was America's first movie theater specifically designed for the viewing of talking motion pictures, originally opened to the public in 1929. The theater has been honored with the Honor Award by the American Institute of Architects for its status as an outstanding architectural achievement of the early 20th century. Today, it still shows first-run and family blockbuster films daily at 7:30pm, seating a maximum of 1,184 visitors. Original Art Deco-style murals by John Gabriel Beckman still adorn its walls, and musical performances from its historic pipe organ are still showcased on Friday and Saturday evenings before each film showing. 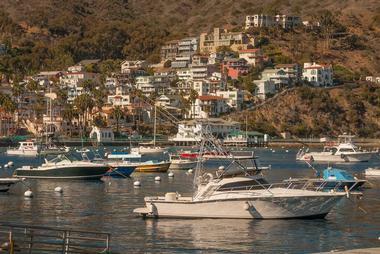 Catalina Coastal Tours and Fishing is Catalina Island's premiere fishing charter company, offering year-round service aboard the company's fishing vessels and passenger boats. All of the company's excursions are led by experienced captains, with charters available for fishers of all ages and ability levels. Standard angling tours last approximately two hours and are available for all fishers with valid California fishing licenses. All fish caught aboard charters are cleaned and preserved by the company's captains so that participants can enjoy their catches later in the day for dinner or take them to local restaurants for expert preparation. Beach adventure tours are also offered, allowing participants to explore remote beach White's Landing, along with dolphin and sea lion sightseeing tours and nighttime astronomy-watching tours. Catalina Island Undersea Expedition offers 45-minute pleasure cruise excursions year-round aboard Sea Wolf semi-submersible vessels, offering Catalina Island visitors chances to view the region's marine life in an up-close and personal setting. The vessels' cabins are submerged five feet underwater, with a private seat and viewing porthole offered for each excursion participant. 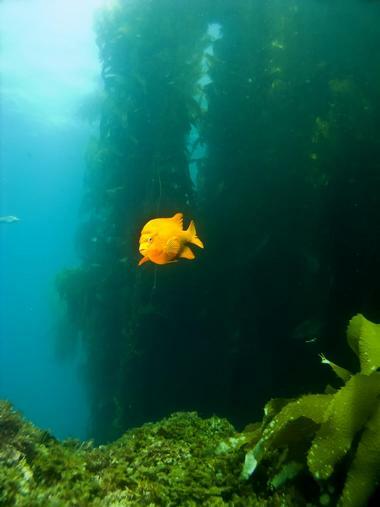 Participants have the opportunity to view native California marine wildlife such as spotted calico bass, bright orange garibaldi, rockfish, urchins, and bat rays, with freedom to roam around the climate-controlled cabin for best views. Ticket prices are available for adult, child, and senior tour participants, with discounts offered for active military members and participants booking advance tour tickets. Steve's Steakhouse and Seafood is one of Avalon's premiere upscale seafood restaurants, offering breathtaking panoramic views of Avalon's harbor from its location on Crescent Avenue. The restaurant has been in operation for more than 40 years and offers gourmet seafood dishes at lunch and dinner throughout the week, including salmon, swordfish, ahi tuna, lobster, and king crab dishes. Catches of the day are offered as dinner specials, along with a wide variety of land fare, including New York strip steak, filet mignon, and a variety of burger and sandwich options. Domestic and import beer is available on draft or in bottles, along with an extensive wine list highlighting Sonoma County and Napa Valley favorites. 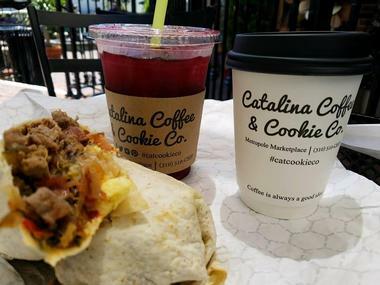 16.Catalina Coffee and Cookie Co.
© Catalina Coffee and Cookie Co.
Catalina Coffee and Cookie Co. is a casual dining cafe and restaurant located within the Metropole Marketplace along Crescent Avenue in downtown Avalon, serving coffee beverages and hot breakfast all day long. The restaurant has been a recipient of multiple Taste Around of Avalon awards for unique menu options such as its strawberry hibiscus tea. It opens daily at 5:00am and serves a full menu of coffee shop beverages, including smoothies, ice-blended drinks, and flavored lattes. Breakfast options include ham and cheese croissants, vegetable frittatas, breakfast burritos, and build-your-own breakfast sandwich options. The restaurant is also home to the city's only fresh fruit frozen yogurt bar and serves a variety of fresh-baked pastries throughout the day, including gluten-free pastry options. Scoops Catalina Island is Avalon's premiere ice cream shop, offering a variety of homemade ice cream flavors crafted according to Italian ice-cream-making traditions. All ice cream is kept in Pozetti-style refrigerated wells, which allow for maximum temperature control and preservation. Preservative-free ice cream flavors include traditional favorites such as butter pecan, mint chocolate chip, Oreo cookies and cream, and the shop's signature vanilla bean ice cream, which is infused with Madagascar vanilla beans sourced from R.R. Lochhead's Bourban. 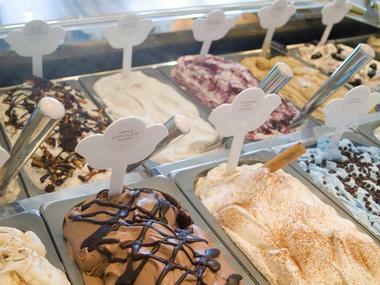 A wide variety of creative Italian gelato flavors are also offered, including cinnamon rice pudding, amarena cherry, and New York-style wild berry cheesecake. In addition to its ice cream offerings, Scoops is also proud to serve Starbucks coffee beverages and treats. 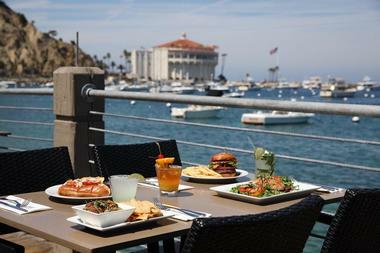 Bluewater Avalon Seafood Restaurant has been voted as one of Catalina Island's best attractions, offering full lunch and dinner menus at its waterfront restaurant and patio. The restaurant focuses on dishes prepared with fresh, sustainably-sourced seafood, open daily at 11:00am for full kitchen and bar service. Casual lunch fare includes fish tacos, crab BLTA sandwiches, and appetizers such as Thai chili chicken wings and jumbo cocktail prawns, while gourmet dinner dishes focus on land and sea offerings such as prawn linguine, San Francisco-style cioppino, and cedar-plank-prepared salon. A full gluten-free menu is also offered at lunch and dinner, with item substitutions available upon request whenever possible. Happy hour specials are offered weekly on draft and bottled beers, house wines and champagnes, and well drinks. 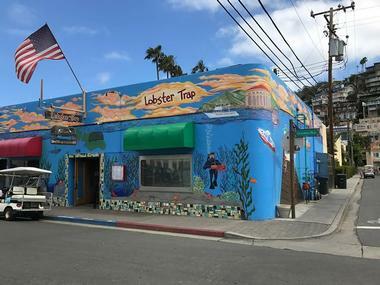 The Lobster Trap is one of Catalina Island's best fine dining destinations, offering great food and friendly service at its Avalon location. 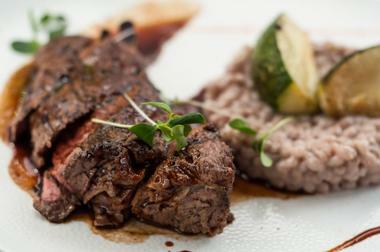 Lunch and dinner are served daily, with an emphasis on fresh fish catches and locally-sourced ingredients. A wide variety of seafood-focused entrees are offered, including Baja-influenced appetizers such as shrimp ceviche and Mexican shrimp cocktail. Full soup and salad menus are offered, along with ample land and sea entree choices, including favorites such as cioppino, Atlantic lobster tails, chicken marsala, and gourmet rib eye steaks. Sandwich options include grilled fish sandwiches, black bean veggie patties, and buffalo burgers, while tacos and burritos made to order highlight ingredients such as sea bass, mahi mahi, and coconut shrimp. 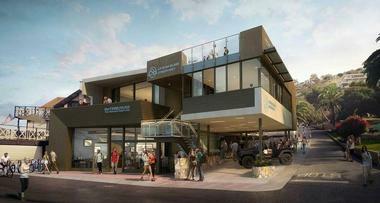 An extensive drink menu is also available, highlighting draft and bottled beers, craft cocktails, and California wines. Catalina Coffee and Cookie Co., Photo: Catalina Coffee and Cookie Co.